Uttar Pradesh Public Service Commission is known as UPPSC. It is the public service commission which has formed for the welfare of the Uttar Pradesh people. It is the authorised state agency to conduct civil services Examination for entry-level appointments to various civil services of Uttar Pradesh. Recently they have released UPPSC recruitment for the post of upper subordinate services for 251 vacancies for the post of sub-registrar, district horticulture officer grade 2, Associate DIOS, district cane officer, district audit officer, Assistant Controller Legal Measurement, Assistant Director Industries, Asst labour commissioner, district program officer, district probation officer, Designated officer. 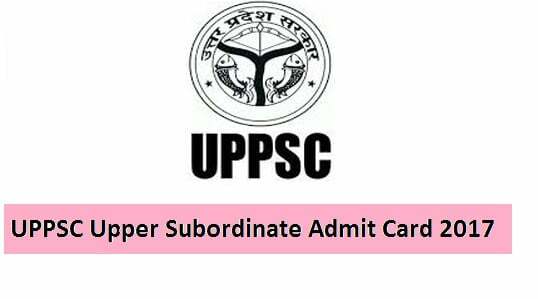 For all posts it is releasing UPPSC Upper Subordinate admit card 2017. Registered candidates can download this UPPSC upper PCS Pre Exam, Admit Card. The selection process of this exam is prelims, mains and personality test. First of all, they are conducting prelims exam. This examination is conducted for two papers, i.e., Paper 1 and 2.